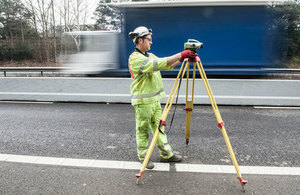 Highways England is to lead a £300,000 study looking at major improvements to road links between the M65 in East Lancashire and parts of Yorkshire. The study – due to start in April – will consider what enhancements could be made to road connections between the end of the M65 at Colne and communities like Skipton in North Yorkshire and Keighley and Bradford in West Yorkshire. We are investing more than £13billion to improve transport across the North so people can get around more easily, quickly and safely. This study is part of our ongoing work to ensure the routes between Lancashire and Yorkshire are fit for the future – helping link communities better and boosting the economy to supercharge the Northern Powerhouse. Beyond the M65, there is currently no consistent strategic route for trans-Pennine traffic, with the limited alternative routes suffering from congestion and drivers facing poor journey times given the large distances involved. The M65 route between Preston and Leeds is five miles shorter than journeys via the M62 but takes 40 minutes longer. The corridor is home to many manufacturing industries which could benefit from improved roads. Investment could boost economic growth not only in East Lancashire, and West and North Yorkshire, but also beyond, across the whole of the North of England; this could support jobs, housing and economic opportunities in the area in line with the aspirations of Transport for the North (TfN), the partnership making the case for pan-Northern strategic transport improvements. Investment to upgrade this corridor would also help to relieve congestion on the M6 and M60 in the longer term as well as providing greater network resilience. This study will look at the issues currently facing road users in the trans-Pennine corridor, the extent to which the lack of strategic connection hinders growth, and options for improving those journeys and boosting economic growth. It will also look at how improvements could be used to support other trans-Pennine routes such as the M62. This initial strategic assessment will be followed by analysis of potential options – and will consider the difficult terrain, environmental impacts, economic growth, the role of other modes in the corridor and concerns and aspirations of key road user groups. Working with TfN, Highways England is aiming to conclude and publish its findings by the end of the autumn, delivering a Strategic Outline Business Case for ministers to consider if there is a case for future investment.